PR Daily recently published our blog post about Managing Online Brand Hate. When confronted with negative online content that hinders your business or damages your organization’s reputation, the best advice is to remain calm and make a sound assessment. 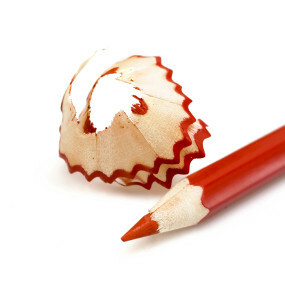 While the first reaction may be to blast away at the hate blog, defamatory post, negative news article or nasty review, brand managers have found that it makes more sense to slow down and develop a strategy before confronting the source, assuming you can figure out who posted the negative information in the first place. 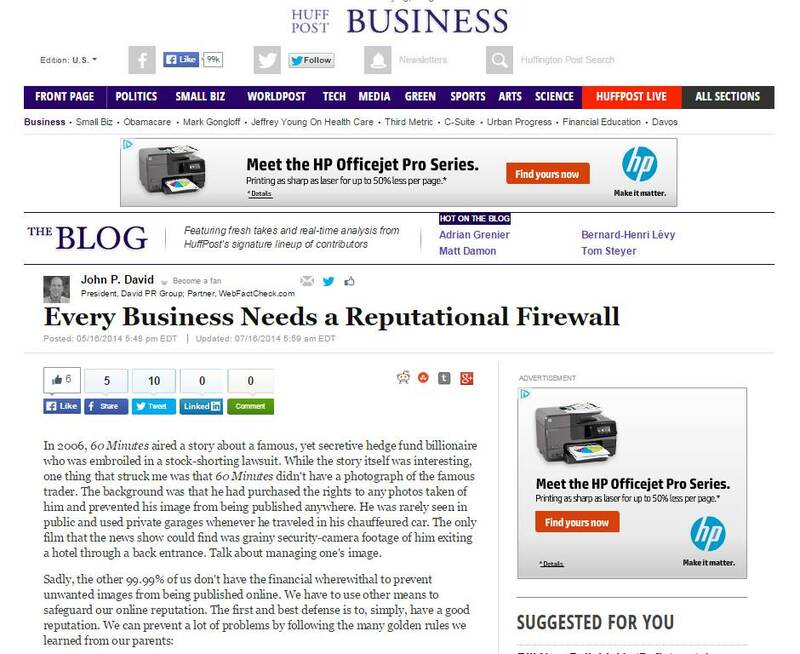 The Huffington Post regularly runs our articles on online reputation management and how to handle online issues. This piece explains why being off of social media sites and keeping a low profile might be a mistake, particularly if you have to deal with an online reputation crisis. 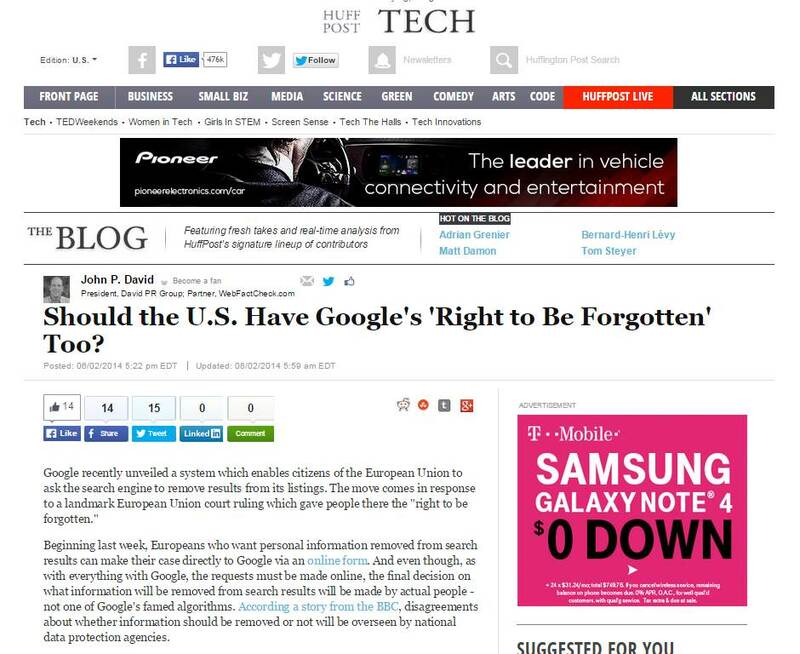 Should the U.S. Have Google’s Right to be Forgotten? 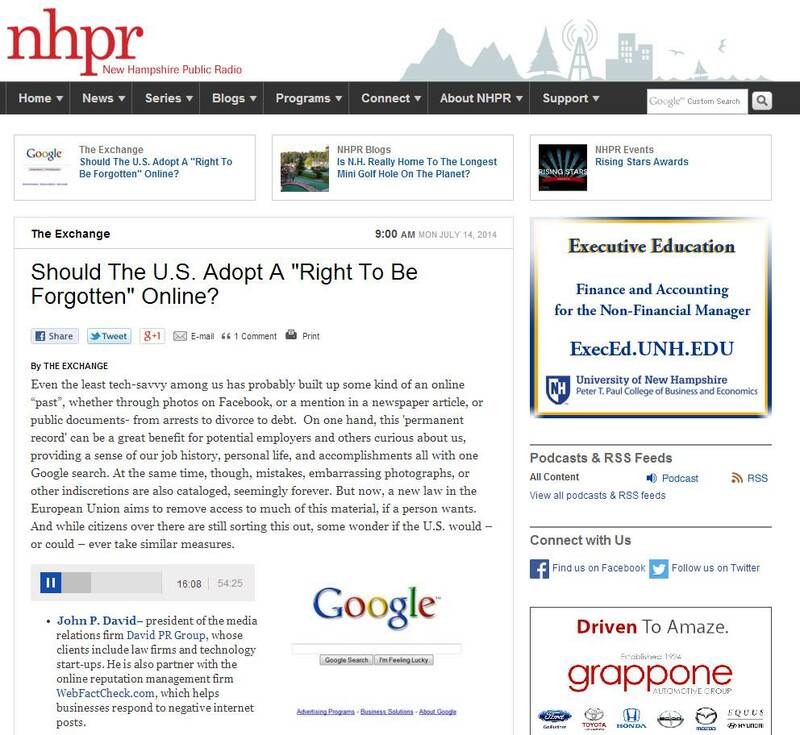 Listen to John P. David of WebFactCheck on New Hampshire Public Radio discussing Google and the “right to be forgotten.” More information on the right to be forgotten can by found here. 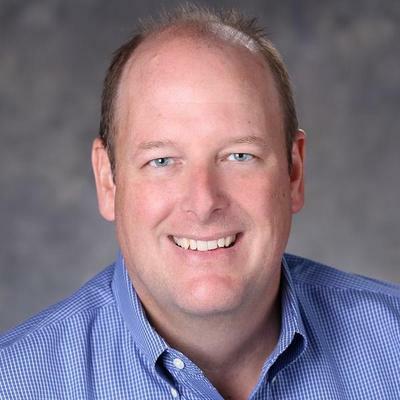 David was joined on NHPR by David M. Ewalt– a journalist covering technology and the game business and Nuala O’Connor, president and CEO at the Center for Democracy & Technology. 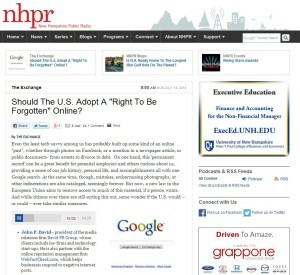 Huffington Post recently published our post about how all online reputation management tools are not created equal. 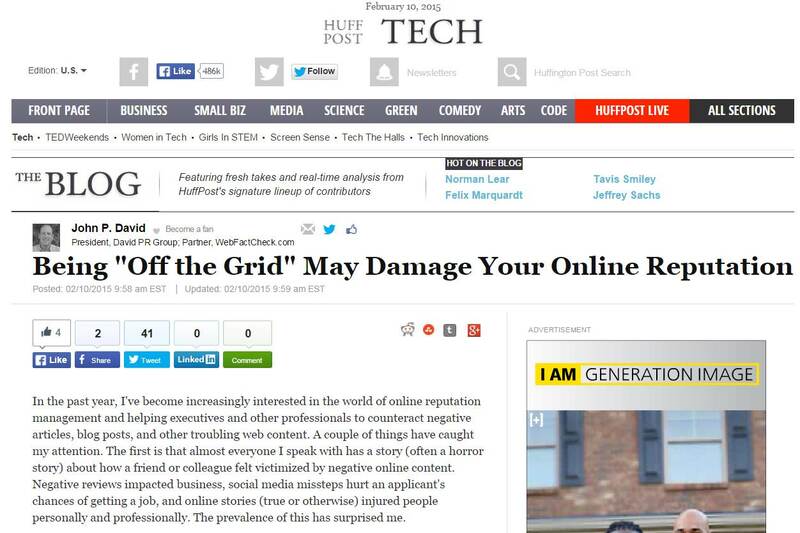 Huffington Post recently ran our blog post about options for removing damaging online content. See more info on online image repair. 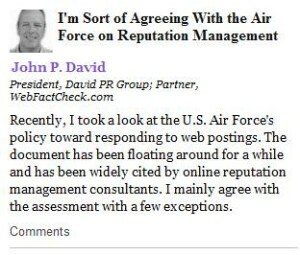 Today, the Huffington Post published our blog on online reputation management and the Air Force Web Posting Response Assessment. We largely agree with USAF but with a couple exceptions, particularly when to respond to negative posts. (MIAMI) Oct. 1, 2013 – WebFactCheck.Com, a new reputation management site devoted to evaluating the accuracy and fairness of negative blog posts, officially launched today. The company comprised of former journalists, professional researchers and field experts will review and fact-check the veracity of negative postings made by bloggers about companies or individuals. In the “anything goes” age of the Internet, people are seldom held accountable for the words they distribute into cyberspace. A single vitriolic post defaming the services or products of a company can have a quantifiable negative impact on that company. While most reputation management companies stress that such material should be simply suppressed, WebFactCheck.com also advocates for a means to respond. 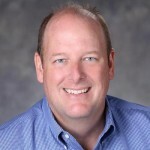 No other reputation management firm offers its clients an objective analysis of offending content, a detailed report featuring a thumbs-up or thumbs-down rating and a means through which to publicly respond (i.e. professional news release). WebFactCheck.com is an online reputation management company comprised of former journalists, professional researchers and field experts. The company specializes in the analysis of negative material directed at individuals or businesses, including blog posts, videos or published news stories. For more information, visit www.WebFactCheck.com or call (888) 960-0086.